2. Click the “Submit Work” button in the left sidebar menu. 3. 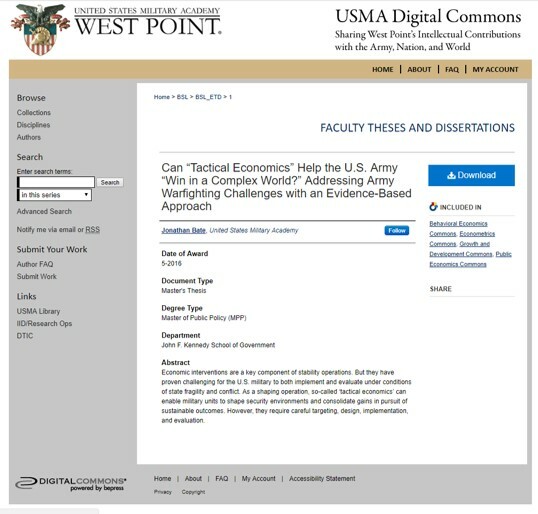 Click the “West Point Research Articles and Papers” button at the center of the page. 4. If you do not already have a bepress account, follow the instructions to create a new user account with bepress.com using your USMA email address. An email with a confirmation link will be sent to you. Be sure to check your junk/spam folder if you do not receive the conformation. If you already have an account and you have used the current computer to sign in, you may already be logged into your account and can skip this step. Otherwise, enter your email and password. 5. Complete the submission form thoroughly with descriptive details. In particular, take note of the fields highlighted in the following slides. 6. In some cases, papers may be indexed by PebMed (check: https://www.ncbi.nlm.nih.gov/pmc/) and assigned an eight digit ID number (e.g., PMID 29385151). If your paper has a PMID, you can input the ID in the import box, click “Import,” and SOME metadata fields will automatically import. However, you will need to review and edit the imported information and manually input information that was not imported. 7. Enter the title using Headline Capitalization. It should be entered exactly as it appears in the manuscript of your work. 8. Enter complete and accurate information for each contributing author, taking particular care to enter author emails for USMA personnel and every author’s affiliation, especially partner institutions (e.g., Keller Army Community Hospital, DARPA, Army Research Laboratory). Verify that “United States Military Academy” has been used as the institution affiliation for each USMA faculty and staff author. 9. Select whether or not the work includes a cadet contributing author. 10. Identify the USMA Research Units affiliated with the work as this field will determine where the record is displayed in USMA Digital Commons. More than one unit can be selected for interdepartmental works. 11. Enter, at a minimum, the month and year of the work. 12. 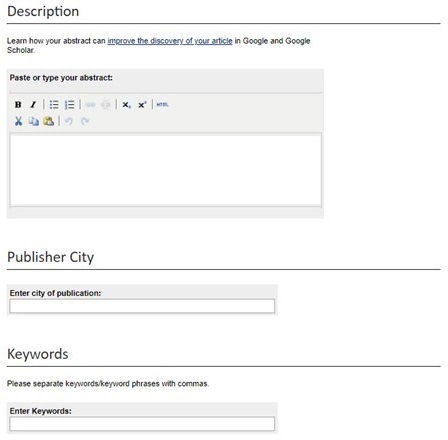 Enter the publication (journal title) in which the paper first appeared. 13. Select the document type for this work. 14. Select one or more disciplines that best describes your work. These fields will make your work more discoverable by external scholarly search engines (e.g., Google Scholar). 15. The final required field provides access to the work. In cases where the submitting author holds copyright and is confident about their right to submit the full-text file, please proceed to select the option to upload the file or import from remote site. In cases where the submitting author is unsure about their right to submit the full-text file, please select the option to link out to file on remote site and use the URL provided by the host website linking directly to the full-text. 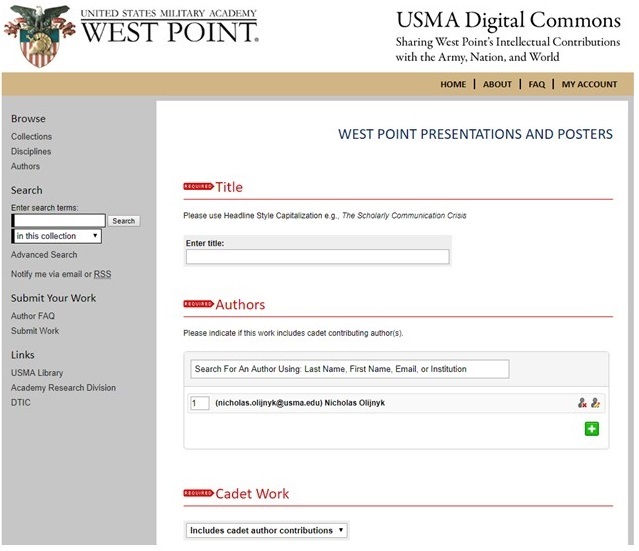 Linking out to a file hosted on a remote site allows the full-text to remain accessible, yet also allows the work to be described, accounted for, and made discoverable through USMA Digital Commons. Contact the Library for more nuanced scenarios at nicholas.olijnyk@westpoint.edu. 16. While not required, submitters are encouraged to fill out the fields that are not required as they will enhance discoverability, management, and completeness of the record. 17. After completing the appropriate fields, review the information to verify that it is complete and accurate, then click the “Submit” button. 18. Library staff will make the posting public after reviewing the submitted information. 3. 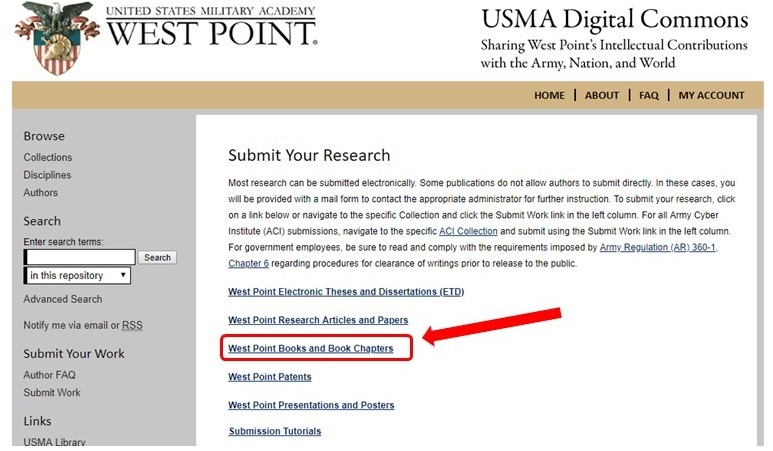 Click the “West Point Books and Book Chapters” button at the center of the page. 6. Enter the title using Headline Capitalization. It should be entered exactly as it appears in the manuscript of your work. 7. Enter complete and accurate information for each contributing author, taking particular care to enter author emails for USMA personnel and every author’s affiliation, especially partner institutions (e.g., Keller Army Community Hospital, DARPA, Army Research Laboratory). Verify that “United States Military Academy” has been used as the institution affiliation for each USMA faculty and staff author. 8. Select whether or not the work includes a cadet contributing author. 9. Identify the USMA Research Units affiliated with the work as this field will determine where the record is displayed in USMA Digital Commons. More than one unit can be selected for interdepartmental works. 10. Enter, at a minimum, the month and year of the work. 11. Enter the original publisher name. 12. Select one or more disciplines that best describes your work. 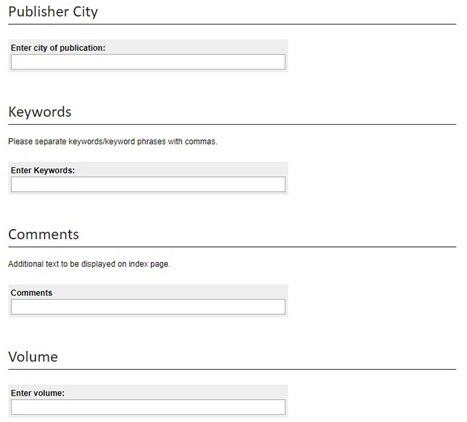 These fields will make your work more discoverable by external scholarly search engines (e.g., Google Scholar). 14. While not required, submitters are encouraged to fill out the fields that are not required as they will enhance discoverability, management, and completeness of the record. 16. After completing the appropriate fields, review the information to verify that it is complete and accurate, then click the “Submit” button. 17. Library staff will make the posting public after reviewing the submitted information. 3. 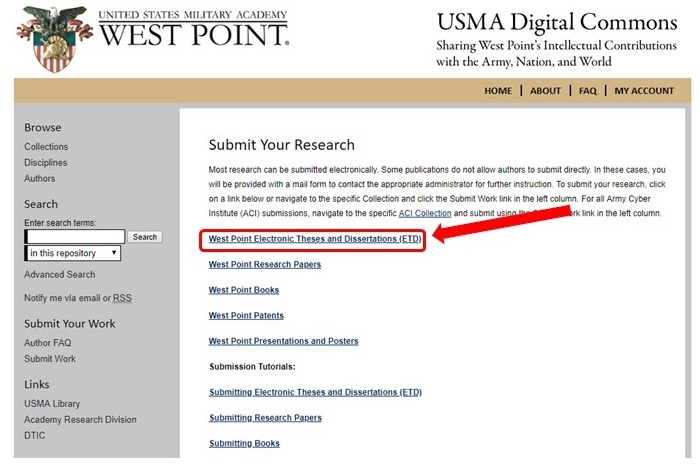 Click the “West Point Electronic Theses and Dissertations (ETD)” button at the center of the page. 8. 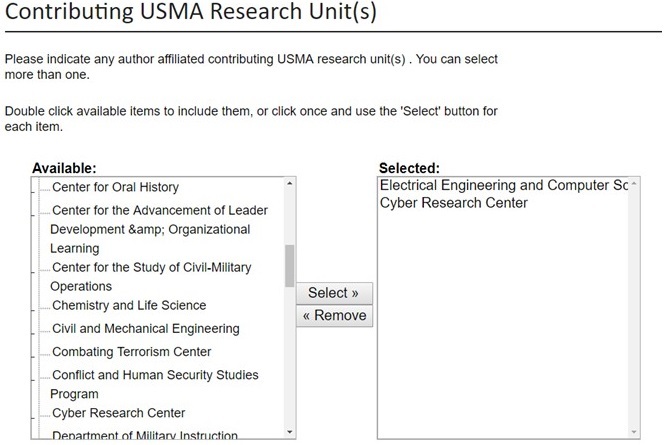 Identify the USMA Research Units affiliated with the work as this field will determine where the record is displayed in USMA Digital Commons. More than one unit can be selected for interdepartmental works. 12. 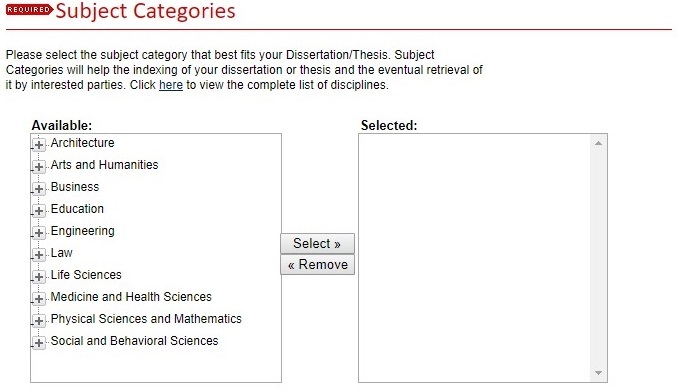 Select one or more subject categories that best describes your work. These fields will make your work more discoverable by external scholarly search engines (e.g., Google Scholar). 14. Enter the academic department from which the work was produced (not USMA department). 3. 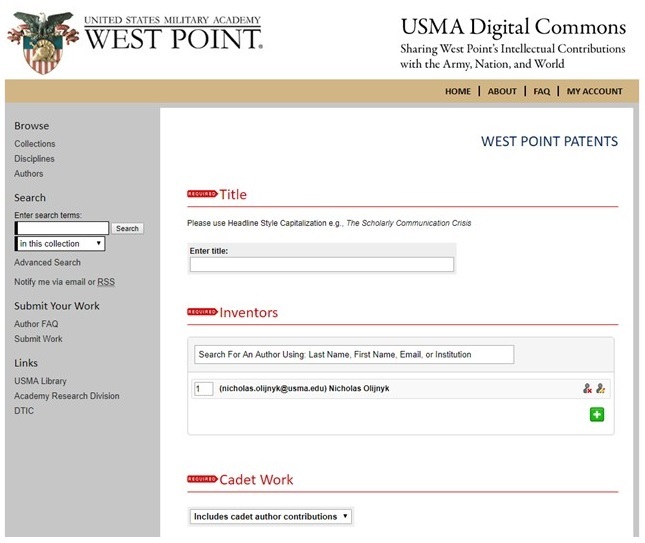 Click the “West Point Research Patents” button at the center of the page. 7. Enter complete and accurate information for each contributing inventor, taking particular care to enter inventor emails for USMA personnel and every inventor’s affiliation, especially partner institutions (e.g., Keller Army Community Hospital, DARPA, Army Research Laboratory). Verify that “United States Military Academy” has been used as the institution affiliation for each USMA faculty and staff inventor. 8. Select whether or not the work includes a cadet contributing inventor (author). 10. Select the document type for this work. 13. The final required field provides access to the work. In cases where the submitting author holds copyright and is confident about their right to submit the full-text file, please proceed to select the option to upload the file or import from remote site. In cases where the submitting author is unsure about their right to submit the full-text file, please select the option to link out to file on remote site and use the URL provided by the host website linking directly to the full-text. Linking out to a file hosted on a remote site allows the full-text to remain accessible, yet also allows the work to be described, accounted for, and made discoverable through USMA Digital Commons. Contact the Library for more nuanced scenarios at nicholas.olijnyk@westpoint.edu. 15. After completing the appropriate fields, review the information to verify that it is complete and accurate, then click the “Submit” button. 16. Library staff will make the posting public after reviewing the submitted information. 3. 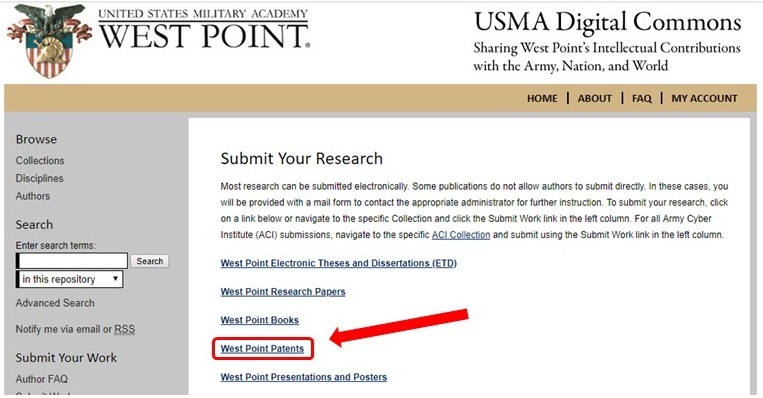 Click the “West Point Research Presentations and Posters” button at the center of the page. 9. Provide the event name where presentation and/or poster presented. 11. Provide a brief description of the presentation and/or poster. 12. Enter, at a minimum, the month and year of the work. 13. Select one or more disciplines that best describes your work. These fields will make your work more discoverable by external scholarly search engines (e.g., Google Scholar). 14. Select the document type for this work. 15. While not required, submitters are encouraged to fill out the fields that are not required as they will enhance discoverability, management, and completeness of the record. 16. The final required field provides access to the work. In cases where the submitting author holds copyright and is confident about their right to submit the full-text file, please proceed to select the option to upload the file or import from remote site. In cases where the submitting author is unsure about their right to submit the full-text file, please select the option to link out to file on remote site and use the URL provided by the host website linking directly to the full-text. 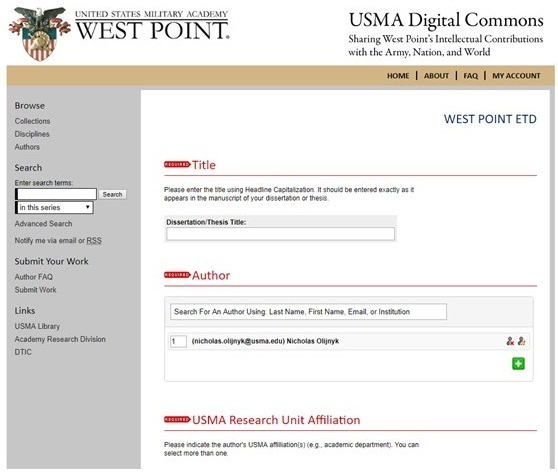 Linking out to a file hosted on a remote site allows the full-text to remain accessible, yet also allows the work to be described, accounted for, and made discoverable through USMA Digital Commons. Contact the Library for more nuanced scenarios at nicholas.olijnyk@westpoint.edu.